Within the EBU Teachers Association (EBTA) there are two main grades, the Full Members of EBTA, and the Professional Members. Both groups are able to describe themselves as EBTA Qualified Teachers. What makes an EBTA Professional? 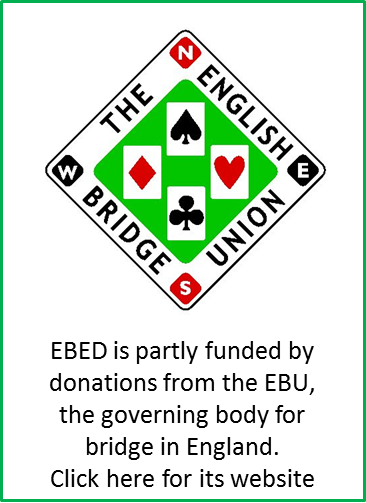 EBTA Professional Members have a minimum of 5 years teaching experience (of which at least 2 must be teaching bridge). They have a proven track record of excellent teaching from their employers (or, if teaching is all done privately, from the students themselves) and, with a handful of exceptions, they will have attended at least one Bridge for All Teacher Training Workshop or EBTA Teachers' Jamboree. They also have a sound understanding of bidding and play - the emphasis is on sound, not expert, evaluated by a written test of bridge knowledge and an oral examination. Finally they are prepared to be an essential part of the development of EBTA by helping to run workshops and other training events, participate in the assessment processes and act as mentors to other bridge teachers. Application form for becoming a Full EBUTA Member here. Confused about the difference? Bridge for All teachers have been specially trained to use the BFA programme - the approved learn and play programme developed by the EBU. All Bridge for All teachers belong to EBTA but the EBTA list also includes many other teachers who have been teaching for many years and prefer to use their own teaching methods. What is the EBTA Diploma? Many years ago, there were “O” and “A” level EBTA Diplomas managed by the great Rhoda Lederer. These exams no longer exist, but some of the teachers who undertook these exams very much do! If you are interested in any of the above please contact Lisa on 01296 317217 who will be able to assist you.